TITUSVILLE, Florida - The Titusville Police Department is seeking the public's assistance in identifying burglary suspects who stole merchandise from a Metro PCS store and adjoining stores on Garden Street in Titusville, Florida. 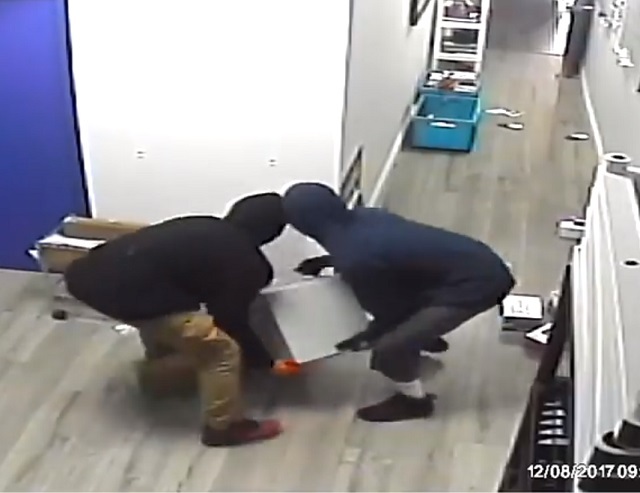 The masked burglars wearing hoodies smashed through a store front window to gain entry into the businesses and were able to steal electronics and a safe during the heist. According to Titusville police, the suspects used a dark-colored crossover SUV that was similar in size to a Hyundai Santa Fe or Ford Edge during the burglary. If you have any information regarding this burglary, Titusville police ask that you call Crimeline at 800-423-TIPS.